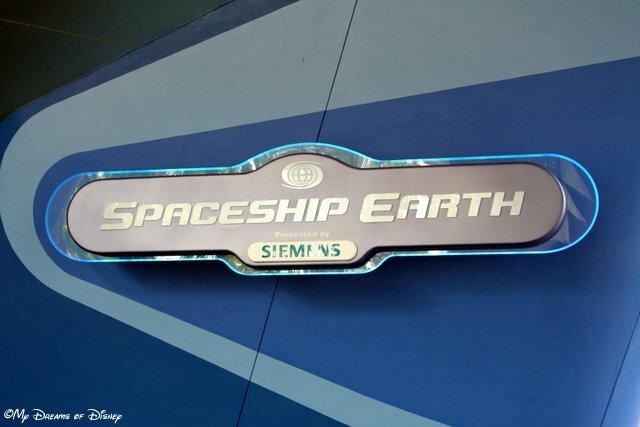 Spaceship Earth was first sponsored by Bell System, then AT&T, but it is now sponsored by Siemens. Hello everyone, and welcome to My Dreams of Disney! Today we are continuing our #DisneyWorldCountdown, and we are now down to #Day16 in our countdown! For this day, we are going to focus on one of my favorite attractions — Spaceship Earth! This is not just an attraction — like all of the Future World exhibits, it’s also a pavilion, and it is an engineering marvel in my opinion. The ride is a dark ride, in a slow moving space train that takes you up and into the geodesic dome and tells you all about the way communication has come about on our planet. It’s a really neat ride because it isn’t just a fun time — it’s a history lesson also, and now, with the changes that have come about since Siemens became the sponsor, you will now be able to interact with and help shape how your future might look. The narrators for the attraction have been, in order, Lawrence Dobkin, Walter Kronkite, Jeremy Irons, and now, Dame Judi Dench. To be honest, even though I have been on the ride when Dobkin and Irons were narrating (at least, and perhaps also with Kronkite), I scarcely remember what it was like, and my favorite rendition is this version with Dench. What about you? At night, Spaceship Earth is — bar none — one of the best structures to photograph! In my opinion, Spaceship Earth is without a doubt one of the best structures in all of Disney to photograph, especially at night. The triangles of the dome really make for some very interesting colors at night, and they capture it and refract it and change it so that it’s almost like a wave of color! Here you see Spaceship Earth standing tall and proud. This shot was taken from the top of the World Showcase. What do you think of Spaceship Earth? Is it a must ride, or do you only need to see it every now and again? Let me know in the comments below, and thanks for stopping by! 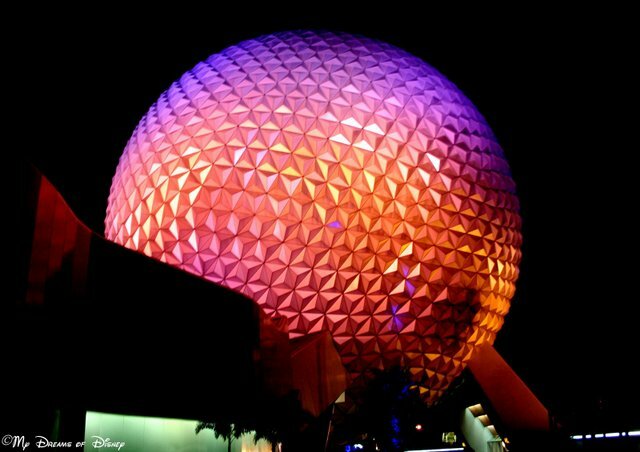 Spaceship Earth, the iconic structure at Epcot, is our choice for Tiggerific Tuesday Trivia! Hello everyone, and welcome to this week’s Tiggerific Tuesday Trivia segment! We are joined, as always, by Jenn from Disney Babies Blog, Heidi from Heidi’s Head, and Jodi from Magical Mouse Schoolhouse! Perhaps we will be joined by you, too? If you have a Disney blog and want to link up with us, feel free to do so, and thanks! There is some debate over who the original narrator of the attraction was. Some say Vic Perrin, and some say Larry Dobkin. The second narrator was Walter Cronkite, followed by Jeremy Irons, and lastly, Judi Dench. Did you like my Spaceship Earth trivia? If so, let me know in the comments which ones you did or did not know about, and thanks! Now, go check out the rest of the entries from this week, and thanks for stopping by! Spaceship Earth, the focal point of Epcot! Hello everyone, and welcome to the first stop in our journey around the Future World of Epcot! 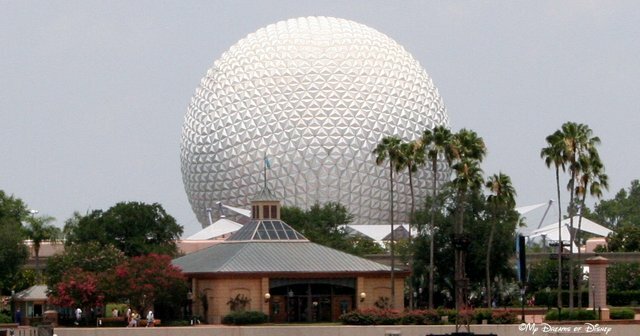 This is Spaceship Earth, which I didn’t know until I started this project was actually considered a pavilion of it’s own! Did you know that? Spaceship Earth is one of our favorite attractions at Epcot, and my daughter Sophie and I love to ride in it and learn about our past in ways that only Disney can teach us. Where else do you get a front row seat of Pharaoh, the Phoenicians, or the Roman Empire and it’s “World Wide Web”? Spaceship Earth is a geodesic dome, which has a diameter of 165 feet, a circumference of 518.1 feet, and a volume of 2.35 million cubic feet! In addition, there are 11,324 tiles on the outside of the dome, and it has a weight of 15,520,000 pounds (7,760 tons!). The ride itself is classified as a dark ride, which doesn’t necessarily mean it’s scary — just that it takes place in a darkened environment. You load on an Omnimover, which travels at a constant slow rate of speed to guide you through the attraction. The music you hear is offset by narration, currently the narrator for the ride is Dame Judi Dench. Previously to her being the narrator you had Jeremy Irons (Scar from The Lion King, you know), Walter Cronchite, and the original narrator, Lawrence Dobkin. Your trip through the history of communication lasts 15 minutes, and is a great attraction to enjoy when the blazing Florida summer heat is at it’s worse. Traditionally, Spaceship Earth has longer lines at park opening than it does in the afternoon because everyone seems to congregate there first because it’s the first thing people generally see at Epcot — unless they come in from the International Gateway between France and the United Kingdom. Part of the enjoyment of Spaceship Earth is that you are able to plugin demographics information about where you live, your picture is taken as you ascend into the dome, and at the end, you answer questions on your car about what you want your future to look like. After that, you get off the ride, and enter Project Tomorrow, which has a lot of different activities you can enjoy, as well as seeing your pictures appear on the globe where you touched in your car. You can also send an email of your video to your friends so they can see what you have been up to! Like many things that Disney does, Spaceship Earth is a great, unique attraction and pavilion that does an incredibly good job at teaching you about communication, history, and our past, but does it in a way that you are able to have fun and not really focus on the fact that you are learning things. It is this unique balance of education and entertainment that has made Epcot one of the most popular parks at Walt Disney World, and is a signature statement for how Disney handles things. Thanks for stopping by and reading about Spaceship Earth!